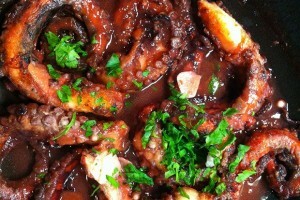 Octopus is the Lenten fare par excellence in Ithaca. There is plenty of it, it is rich and filling despite its associations with the fast, and it is cooked in several unusual ways. The following recipes were given to me by Mihalis Maghoulas, an Ithacan native who tinkers in the kitchen in his spare time and who has recorded his island’s rich culinary heritage in a selfpublished book called, simply, Ithacan Cuisine. This is a beautiful dish and an excellent meze with red wine and with ouzo. 1. Place the octopuses in a large saucepan, cover, and cook over very low heat until they are tender, 30 to 40 minutes. They will exude their own juices; reserve them to make skordalia Remove the octopuses with a slotted spoon and divide by their tentacles so that you have at least 16 pieces. Preheat the broiler. 2. Heat 4 to 5 tablespoons of the olive oil in a large skillet and fry the octopuses in the oil over medium-high heat until they turn dark pink, 5 to 7 minutes. Pour in the wine and simmer over medium-high heat until the wine has evaporated. 3. While the octopuses are frying, toast the bread on both sides under the broiler, about 6 inches from the heat. To serve, place the toast on a platter and drizzle with the remaining olive oil. Top each piece of toast with one or two tentacles and any juices left from the skillet. Season with salt and pepper and garnish with parsley. Note: If using frozen octopus, defrost in the refrigerator overnight.